All you need is love. The Beatles sang it, Shakespeare wrote about it and Hallmark manufactured it. We’ve found a place for love in movies, television, books, radio and even our personal lives, but what about our businesses? As the Hebrew calendar draws to a close, in Israel, we are all busily preparing for the Jewish New Year celebrations and Yom Kippur AKA, Day of Atonement. While this usually involves an exhaustive amount of food, family, prayer, fasting and more food, it is also often the time where self introspection is encouraged. What did I do wrong this year and how can I improve for the next? 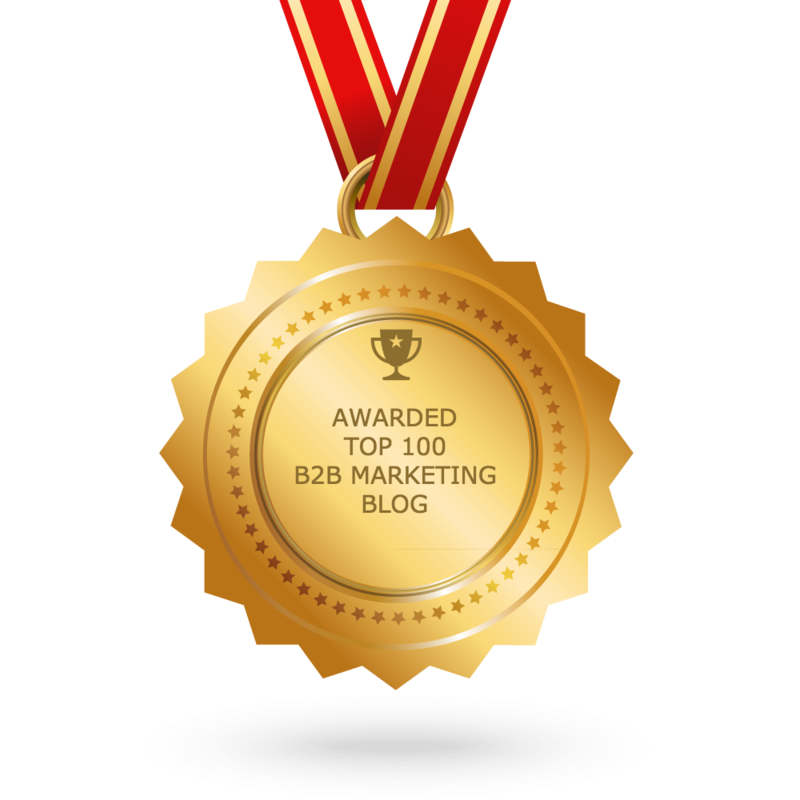 At Marketing Envy, we decided that our new year blog need not be a list of mistakes you’ve made these past few months, or the tools or strategies to fix them (for that, you can read our last post). We’ve decided to focus on LOVE. Why love? Often, as startups grow, they lose sight of of the number one priority - customer needs. Every good marketer knows that it is more cost effective to maintain and grow a satisfied customer than to continuously run after new ones. It’s simple; show your customers you love them and they will love you back. Ever had a bad retail experience and felt the need to rant and rave to the world about it? 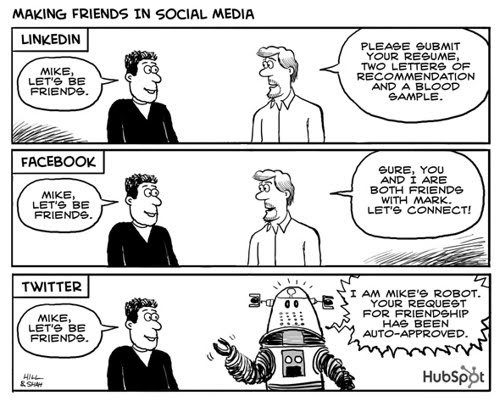 We’ve all done it (and Facebook has even made it a hell of a lot easier to do). But it works the opposite way as well. Did you know that a happy customer is likely to tell between 4 to 6 people about their positive experience? Even better; research has shown that customers are willing to pay up to 60% more for quality customer service. So here, from Marketing Envy with much love and thanks for your loyalty and business this year, we present the ultimate, ‘Love Thy Customer’ List. 12 ideas of how you can show your customers how much you love them - one for each month of the new year. In 2011, a little girl named Lily Robinson, wrote to Sainsbury’s (a supermarket chain in the UK) to tell them that she felt they should change the name of their ‘tiger’ bread to ‘giraffe’ breads, since the bread seemed to resemble the pattern of a giraffe more than a tiger. Turns out, Sainsbury’s thought this was an excellent idea and have since re-named their tiger bread, publicly crediting Lily for the change. Asking customers for ideas or responding to their suggestions is an excellent way to show customer love. When users recommend changes to your website, sales cycle or product, be prepared to act on their feedback (and acknowledge them if the change is made). Tools like, Intercom.IO can automate customer surveys in the form of in-app messages or emails. By putting emoji options at the end of a survey or question you can assess customer happiness and acknowledge the need for change. 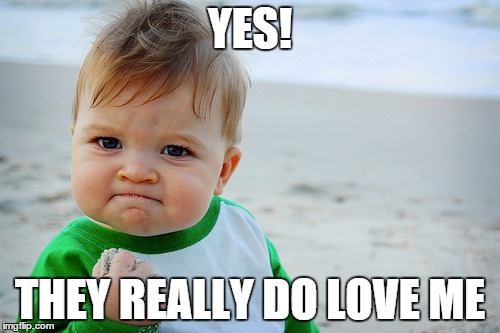 Show customers how much you love them by offering free upgrades or premium trials for a limited period of time (maybe as a Valentine’s gift to your customers for the month of February). It’s the simplest and least expensive way to delight users. This is perfect if you have a SaaS product as it is an opportunity for your users to trial a premium version and maybe even upgrade. Win win! Meet your customers in person in a memorable way or reward long-standing customers with a physical gift delivered in person. Active users will cherish the face-to-face experience and new clients will feel your love and care. 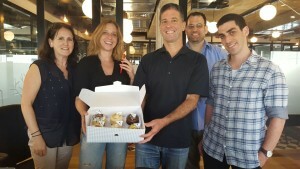 Our treat for new clients is personally-delivered fresh, gourmet cupcakes (and we always remember to snap the moment). It really is a great way to start a new relationship on the right foot. Communication is key. Make sure your customers know what is going on in your business before the rest of the world does. There’s nothing worse than hearing about your vendor’s nice exit on the news, or a customer discovering a change in pricing plan or product the hard way. 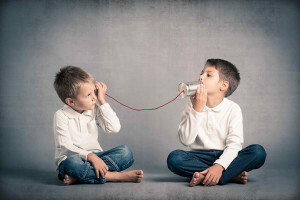 Customers need to hear everything straight from you! Of course, this rule works both ways. Show customers how much you love them by keeping up to speed with news from their company - and don’t forget to congratulate them on a success! Love is a two-way street. If you deliver high quality service, customers are likely to refer you to their friends or colleagues and this kind gesture must be rewarded. 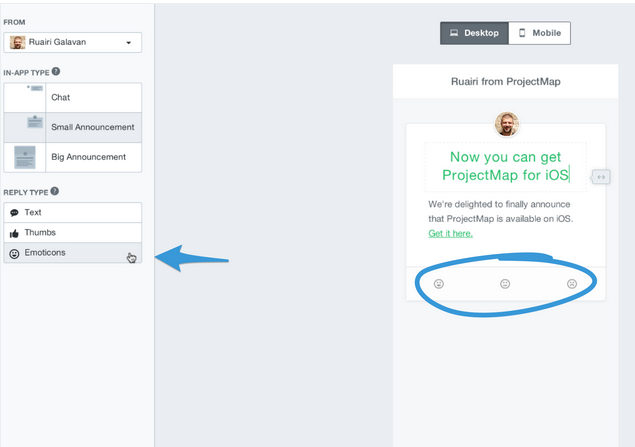 Dropbox is a great example of a SaaS product with a great referral program. If you invite your friends to use Dropbox both you and your friend receive extra data storage. But don’t be selfish. The advantage of working in a smaller scale startup is that you get to know each client’s business well. If you have customers who you think would benefit from using each other’s product/service/advice, introduce them to each other. A selfless act of love and kindness. Nothing beats a laugh. Don’t take yourself too seriously. Consider posting something on your social media pages that will make your followers giggle (you might have noticed that Marketing Envy always starts the weekend with a light-hearted Facebook post). Customers also know how much you care about them when they see you make a fool of yourself. Jodie Ellis from Optimizely hacked experimental marketing when he created the rapper MC Commerce to entertain and educate customers. (Yes, he looked ridiculous but the video is definitely worth watching. Out with the old and in with the new? Not when it comes to customers. 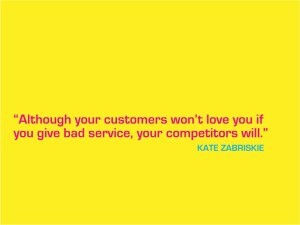 We often get so hung up on pleasing our new customers that we forget to give our old or recurring customers the love they deserve. Consider rewarding your long standing customers with restaurant vouchers, discounted memberships or send over a few bottles of beer to celebrate a holiday. Reminding your loyal customers that you haven’t forgotten them will make them feel warm and fuzzy inside. If someone takes the time to reach out or mention you, it’s bad manners for you to ignore them. 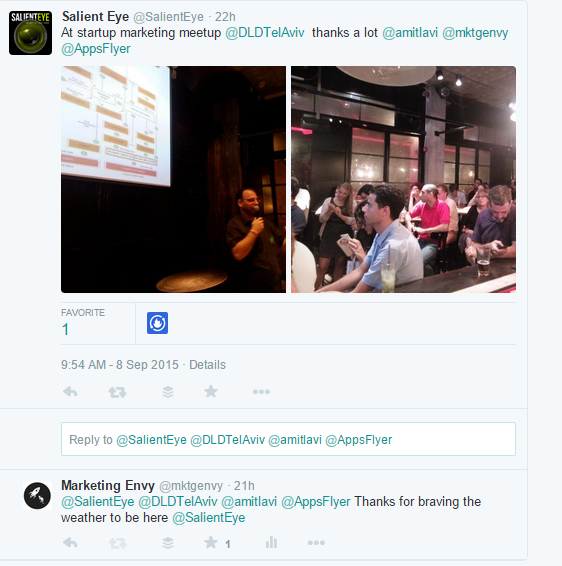 Recognize customer’s social media interactions with you as much as possible. Show them how much your care by retweeting Tweets about their company or just retweeting or sharing their relevant posts. Hot Tip: There are tools out there to make this easier. Connect Twitter to your startup’s Slack account so that you are notified of Twitter mentions. Roundteam.Co is another tool that can be set to automatically retweet mentions or hashtags. See… showing love is actually quite easy. Spreading the love and joy around to your community does not go unnoticed. Show your customers that you are a citizen of the world through acts of charity. Of course, you don’t need to donate on the same scale as Apple or Microsoft. Consider donating $1.00 in the name of each of your customers to a charity of your choice. You can also donate your product or service itself. Sociogram (a video app startup) donated free videos to the families of those serving in the US army abroad during the holiday season. If your budget is really tight and you just can’t afford these sort of donations, consider rounding up your staff and encouraging everyone to work in a soup kitchen for a day. Remember: It’s all about love, but don’t forget to still publicize these acts of charity on your social media pages. If customers don’t know about them, they won’t fall in love with you. Never forget the importance of sharing your knowledge with your customers. Send out regular tips, tricks and industry news through your blogs, emails and monthly newsletters. Anticipate customers' questions and concerns and offer useful information to educate and guide them. Be different from others who are merely promoting products and services in their communications. Ask your customers what they want to learn from you and remember that sharing your knowledge gives customers something valuable for free and proves your expertise. Ok so you’re a small startup… but that doesn’t mean you can’t love big. Being a small company means that you are more likely to be able to offer more individualized attention to your customers. Make sure you are following them on social media, send them personal (and we really mean personal) emails and organize to drop them a line just to see if they need any assistance. Heck… you could even send them a dancing GIF on their birthday. It’s not all flowers and chocolates… simple gestures can go a long way. Love your customers as much as you love yourself (Marketing Envy 9:8). Think about what gestures you would appreciate and start using them on your customers. They don’t have to be complex, expensive or even time consuming. Building a loving relationship with your customers is the only way to keep your clients by you side - through the good times and the bad. Wishing you all a year filled with love and success.